Hydrangea or Ajisai are now in season. This flower is considered as Japan's flower of summer because of its light colors that are refreshing to the eyes. In Japanese literatures, it is used in haikus to symbolize summer. It is not officially summer yet here in Japan. But the weather feels like so - very hot and sunny day. From 5:00 in the morning until 7:00 pm, it is very humid air and up to 30 degrees temperature. Hence, flowers in season came quite early too and one of them is the hydrangea. Last week, I got inspired with the abundance of this flower in several private gardens, public parks, sidewalks, and especially the flower shops. So, I decided to make several arrangements using hydrangea as my main flower. For my first arrangement, I made an Ikebana emphasising mass and line. For the mass, I used a bunch of blue and white hydrangeas. And for the lines I highlighted the nice curves of alliums. 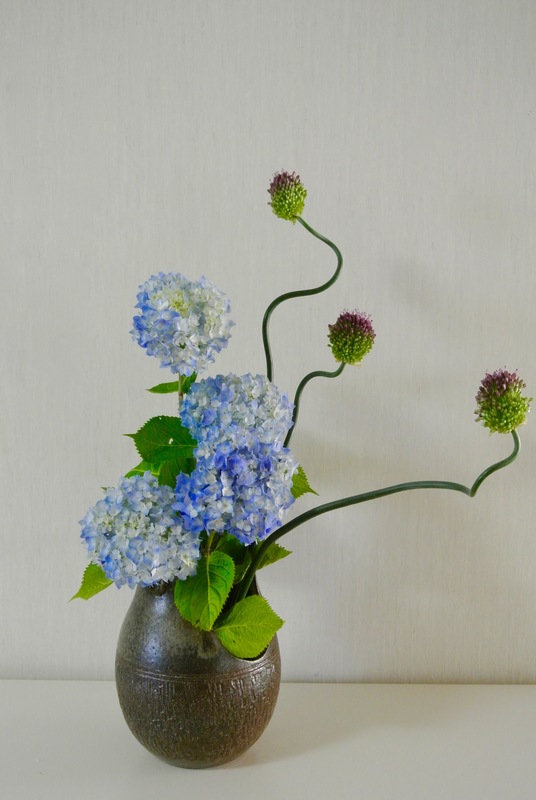 The lines also imitate the wind blowing through a bunch of the hydrangeas. I placed the arrangement in a ceramic vase which is shaped like a water jug. For my second arrangement, I combined hydrangea and birds of paradise. Blue hydrangea to represent summer in Japan. The birds of paradise reminds me of summer in the Philippines. When I was a kid, I love to see the birds of paradise bloom in our garden especially in May. I love picking some stems to put in our small altar or offer them in the community chapel. For this arrangement, the red flower symbolizes the summer heat. In contrast, the blue color represents the cool water.